Guys, I think I love this game. I mean, it's over now, which makes me sad, but... Well, maybe I should tell you what it is. 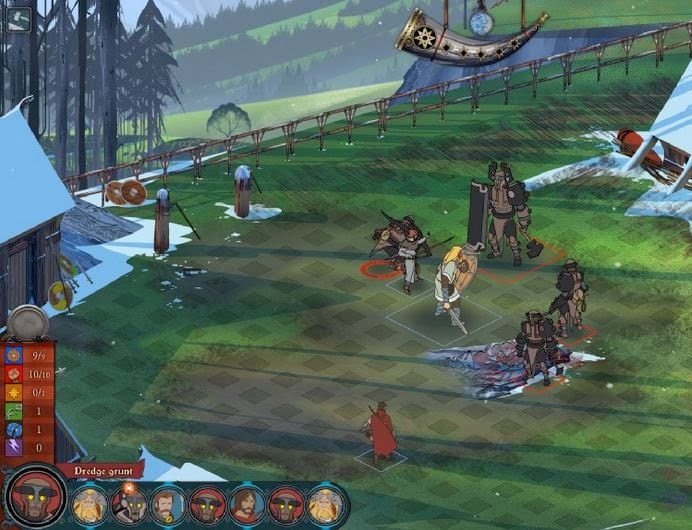 The Banner Saga is a tactical RPG, kickstarted by Stoic Studio almost 2 years ago backed by over 20,000 people. It feels like what would happen if George R. R. Martin hired Don Bluth to make a short version of Final Fantasy Tactics set in a Norse world. You think I'm joking, but play it and tell me I'm wrong. It's set in a fantasy world inhabited primarily by humans, varl (giants with massive horns), and nasty armored things called dredge. For some reason, the sun stopped moving near the horizon and the world is freezing. On top of that, the dredge are rushing out of the north, crushing everything and everyone in their path. Men and varl have to put aside their differences to save both their peoples, but that proves rather difficult. 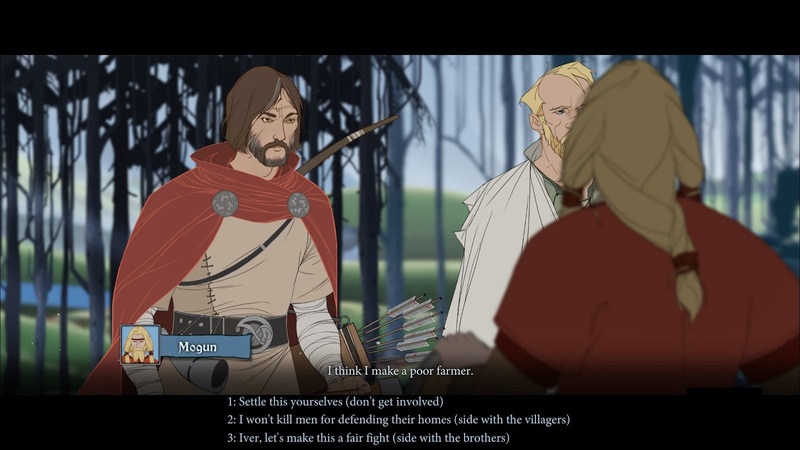 You play a few different characters across the game, reluctant leaders of men and varl stuck in impossible situations. This is the first thing I love about the game. You don't know how to lead. You don't even want to lead. But the game asks you to make impossible decisions of the stand-and-fight vs. run-and-abandon-our-ancestors-home variety and then it makes you question whether you did the right thing. The second thing I love is the game makes you feel like your decisions matter. They don't always, but so many of them do that you don't even notice the others. If you stand and fight, you might lose and be run off anyway, or you might actually win and be forced to make a different decision. Do you let the women of your clan train to fight, even though the men are dead set against putting their wives and daughters in danger? Do you encourage a town you pass by to flee with you, as you did, or stay and defend their homes, as you wish you did? The game itself is a series of macro decisions on how to help your clan escape and survive, interspersed with tactical battles pitting your heroes against a few enemies. These were the third thing I loved. There's almost no dice-rolling; the outcome of your attacks is almost entirely deterministic (some people like to give me crap for designing elements of chance, but guess what? I can love both). And the abilities of the different heroes at your disposal can be combined in unique, sometimes unexpected ways, so that a clever commander can sometimes win even a hopeless battle. The music, the art, the prolonged scenes watching my caravan trudge across the waste (it sounds weird, but those scenes are part of what really drew me into the game), the deaths, the questioning myself as a leader, the triumph when I finally did something right... It's just a good game. If you like tactical games or RPGs, check this one out. 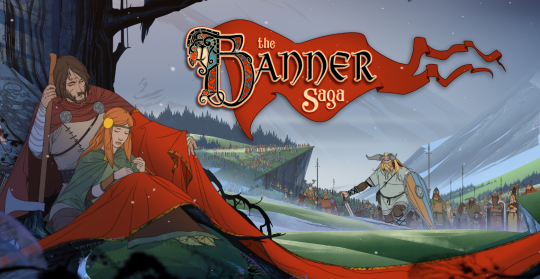 The Banner Saga is strong evidence that games are art. Thank goodness for blogging! I was looking for something fun to read. Now, before I even read this, are you aware the Candy Crush Saga people tried to sue this developer over their use of the term Saga? Or at least they threatened to, I can't remember. I mean how ridiculous is that? Okay, so I was going to check this out anyway, just because of the law suit, but now I'm definitely going to try it. It's Android and iOS only, right? Or do they make a PC version? You just don't want me to get any work done. Really, love the look and sound. How long does it take to play all the way through? Candy Crush Saga. Yes I do know. I didn't want to besmirch this love letter with another developer's ridiculous arrogance. Gameplay Length. I finished it in 17 hours. Need this game. Yes, you do. Is it kid friendly? I'm wondering if it's something I could play with my kids this summer. It looks awesome. Yeah, I looked it up after asking. 25 bucks on GOG ain't bad for a new game.